36. The Mayor and Jurats of Rye to Cromwell. We received yours dated London, 19th Dec., touching Thos. Sadler and Marg. Barclay, who intended to take passage at Rye with certain sums of money. On 12th Dec. last we brought them before us, but could find no certainty of their intentions, and therefore ordered them to be searched. We found in their purses 54s. 5½d. On further examination Thos. Sadler confessed to having five marks in a bag, which we seized, and gave notice to the lord Warden, to whom we committed them on the 29th. He examined them as politicly and gently as was possible, and sometimes with sharp words, the better to bring them to his purpose. Sadler confessed to have delivered 4l. 3s. 2d. to the said Margaret, who brought us where the same money was, but we could find no more. 12 Jan. Hol., p. 1. Add. : Right worshipful. 37. John [Kite] Bishop of Carlisle to Lord Lisle. Commendations to my lady. Acknowledges a present of a barrel of herring and a piece of wine. Sends a token to my lady. Added in his own hand: Thanks him again, and prays him to be good to his servant Rowland. London, 12 Jan. Signed. 38. Sir Brian Tuke to Lord Lisle. You have doubtless long since heard that the King has been pleased to establish my lady Princess to keep her estate at Hatfield beside London, and that my lady Mary is there, and her house dissolved. One of her old servants, Ric. Baker, her gentleman usher, has had his wife attending upon mine, as she still does; and, as both my lady Mary and lord Huse, late chamberlain there, desired me to be good to him, I endeavored to get him the room of sewer with the Princess Dowager of Wales at the new establishment of her house. I think I might have got it and may still; but having been so long with his mistress, he is loth now to serve anyone but the King, and would like the room of a spear at Calais. I know you are importuned by better men than roe. yet you have shown me so much favor that I hope you will do somewhat. This is my first suit, yet I am ashamed to be so bold; but as spears' rooms are not plentiful, I should think myself proud if at my request you gave him a room of 8d. a day to begin with. I have desired Thos. Tuchet to solicit you for an answer. London, 12 Jan. 1533. 39. Count of Cifuentes to Charles V.
Add. MS. 28,556, f. 107 B. M.
* * * * * Thinks the Emperor has heard of the Pope's show of willingness to give the sentence in the English cause. Has consulted with the counsel and lawyers, and agreed to petition the Pope to order sentence to be given in the principal cause without referring the process, as Capisuccha will not return from Avignon until after the winter, and the examination of the process by Simonetta will cause much delay, which the necessity of the Queen and her daughter will not allow. His Holiness agreed to this, and thought all the cardinals would be of the same opinion. Visited the cardinals, and most of them said there was no necessity to refer the process in consistory. Has since found the Pope so cool in the business that he fears delay. His Holiness said that it was necessary for the Emperor to determine to execute the sentence. Replied that what the Emperor had already written by him and Davalos was sufficient; it would not be honorable for the Emperor to give further security before the sentence was pronounced. Heard that the Pope would not go to vespers on Twelfth Night on account of an attack of gout, but that the true reason was annoyance at a letter from the Nuncio with the king of the Romans. At the count's next visit he found his Holiness colder than ever about the cause, and he said that it wad necessary that a person should be appointed to answer on behalf of the king of England. Replied that though he was no lawyer, he did not think this was usual in such cases, especially as it was determined that the excusator should not be heard, and he was surprised at this new proposal. Was told by the lawyers that it could not be justly done. On the Friday following a consistory was held, in which they told the count that not only it was not decided to give sentence without referring the case, but the Pope proposed the nomination of a person on behalf of the King, as the Emperor will hear more fully from the cardinal of Jaen. For fear of excommunication, the cardinals could not repeat what took place, but he thinks the above was the chief point. Will do all he can to see the new steps which are daily taken in England against the Queen (las novedades que cada dia crescen). Believes the Pope and cardinals wish him to press for a declaration and privation in the case of the sentence super attentatis, thinking that when it is despatched the Emperor will be forced to execute it. Thinks it therefore advisable not to press for it, but only for the principal sentence. The executoriales have come from Flanders. Rome, 12 Jan. 1534. Understands that it was concluded in the consistory that sentence should not be given without first referring the case. Will complain to the Pope, and try to have the Auditor appointed to examine the process. It seems that the fact of the cause being so just and the King having appealed to a council is of no avail to check the accustomed delays in doing justice to the Queen. Complained of this to Carne Seca, who replied, without thinking that he was saying anything, that the Pope wished to conclude the case, but prolonged it in the hope that the bishop of Paris would find some good means to get the King to obey the Chnrch out of deference to Francis. All this is to cause delay. The Pope has sent to say that the count has been informed wrongly that he wishes some one to be appointed to answer for the King. Add. MS. 28,586, f. 103. B.M. Abstract of the preceding, with marginal notes. 40. Cranmer to Mr. Butler, his Commissary at Calais. Harl. MS. 6.148, f. 20. B. M. Cranmer's Letters, 277. Desires him to do nothing touching his visitation in those parts till he knows Cramner's mind further, but to make inquisition concerning the pretended marriage between Fras. Hastings and his wife, and when the marriage between her and Davison was dissolved. If Davison is in Calais, he must be cited; if in England, the ordinary of the place must be desired to examine him. Otford, 13 Jan.
41. Thos. Lord Berkeley to Lord Lisle. The bearer of this, a servant of the abbot of St. Austin's, in Brystowe, is desirous of entering your service. You will find him good and honest. Pauntley, 13 Jan. Signed. Harl. MS. 6,166, f. 108. B.M. The bridges mentioned are the following:—Flanceford brigge. 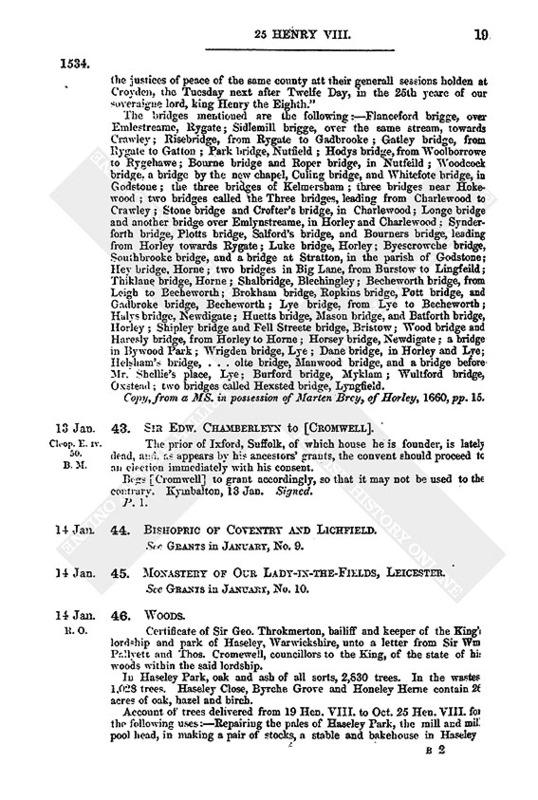 over Emlestreame, Rygate; Sidlemill brigge, over the same stream, towards Crawiey; Risebridge, from Rygate to Gadbrooke; Gatley bridge, from Rygate to Gatton; Park bridge, Nutneld; Hodys bridge, from “Woolborrowe to Rygehawe; Bourne bridge and Roper bridge, in Nutfeild; Woodcock bridge, a bridge by the new chapel, Culing bridge, and Whitefote bridge, in Godstoue; the three bridges of Kelmersham; three bridges near Hokewood; two bridges called the Three bridges, leading from Charlewood to Crawley; Stone bridge and Crofter's bridge, in Charlewood; Longe bridge and another bridge over Emlynstreame, in Horley and Charlewood; Synderforth bridge, Plotts bridge, Salford's bridge, and Bourners bridge, leading from Horley towards Rygate; Luke bridge, Horley; Byescrowche bridge, Southbrooke bridge, and abridge at Stratton, in the parish of Godstone; Hey bridge, Home; two bridges in Big Lane, from Burstow to Lingfeild; Thiklane bridge, Home; Shalbridge, Blechingley; Becheworth bridge, from Leigh to Becheworth; Brokham bridge, Ropkins bridge, Pott bridge, and Gadbroke bridge, Becheworth; Lye bridge, from Lye to Becheworth; Halys bridge, Newdigate; Huetts bridge, Mason bridge, and Batforth bridge, Horley; Shipley bridge and Fell Streete bridge, Bristow; “Wood bridge and Haresly bridge, from Horley to Home; Horsey bridge, Newdigate; a bridge in By wood Park; Wrigden bridge, Lye; Dane bridge, in Horley and Lye; Helsham's bridge, . . . olte bridge, Manwood bridge, and a bridge before Mr. Shellie's place, Lye; Burford bridge, Myklam; “Wultford bridge, Oxstead; two bridges called Hexsted bridge, Lyngfield. Copy, from a MS. in possession of Marten Brey, of Horley, 1660, pp. 15. 43. Sir Edw. Chamberleyn to [Cromwell]. Cleop. E. iv. 50. B.M. The prior of Ixford, Suffolk, of which house he is founder, is lately dead, and as appears by his ancestors' grants, the convent should proceed to an election immediately with his consent. Begs [Cromwell] to grant accordingly, so that it may not be used to the contrary. Kymbalton, 13 Jan. Signed. 44. Bishopric of Coventry and Lichfield. See. Grants in January, No. 9. 45. Monastery of Our Lady-in-the-Fields, Leicester. See Grants in January, No. 10. Certificate of Sir Geo. Throkmerton, bailiff and keeper of the King' lorship and park of Haseley, Warwickshire, unto a letter from Sir Wm Pallyett and Thos. Cromewell, councillors to the King, of the state of hi: woods within the said lordship. In Haseley Park, oak and ash of all sorts, 2,830 trees. In the wastes 1,028 trees. Haseley Close, Byrche Grove and Honeley Herne contain 26 acres of oak, hazel and birch. Account of trees delivered from 19 Hen. VIII. to Oct. 25 Hen. VIII. 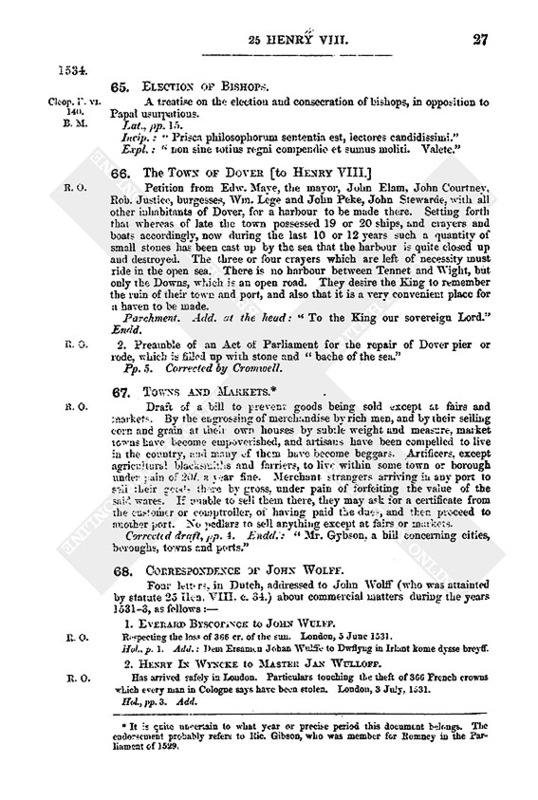 for the following uses:—Repairing the pales of Haseley Park, the mill and mil pool head, in making a pair of stocks, a stable and bakehouse in Haseley for repairing the castle mills, planks for the King's stable, rails round the castle and unto the Byne garden, and repairing Oliver Frances' tenement, in “Warwick, and a few trees sold. The woods and coppice are well inclosed. This view made by Matthew Edwards, Throkmerton's deputy, Nic. Edwards, Ric. Wyrett and Thos. Ebrall, tenants of Haseley, 14 Jan. 25 Hen. VIII. 47. Will Boureman to Mr. Eden, Clerk of the Star Chamber. Requesting that Master Clerk may not be compelled to go to London by a subpœna wherewith he was lately served, in consequence of an arbitrament made by Clerk and Nich. Fitz James, which the latter had refused to sign, in a variance between John Delton. “beadismaker,” of Corscombe, and the writer as canon of Wells. Wells, 13 Jan.
2. Thomas Clerk to the Lord Chancellor. Making a similar request, stating that Delton had obeyed the arbitrament, but the suit Las been renewed by Boureman, as Fitz James had not signed the award. Wokey, 14 Jan. Signed. Titus. B. 1. 419. B.M. To cause indictments to be drawn for the offenders in treason and misprision concerning the Nun of Canterbury. 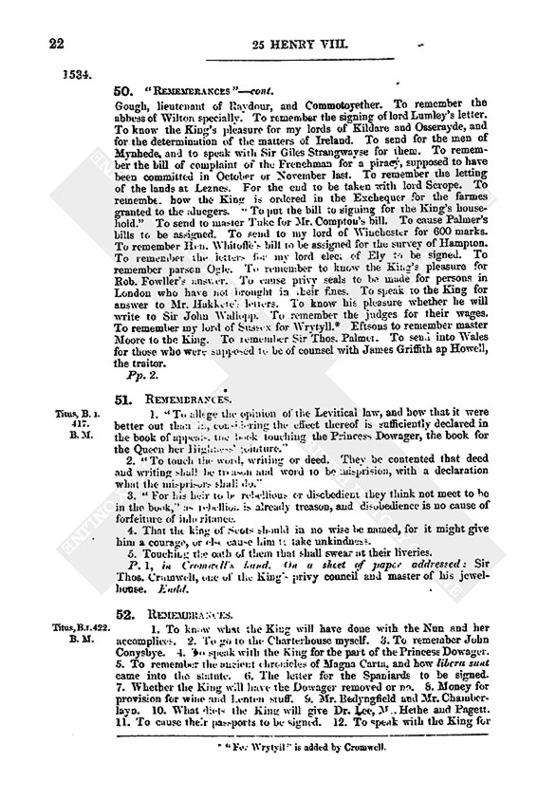 To remind the King of the establishment of judges and other officers in Ireland; the state of Wales; my lord of Northumberland's end with the King for the money last paid for him; and the escape of two prisoners from the prison of the bishop of Exeter. To speak with the King's counsel for finishing the book of the Staple. To remember a certain thing found in Suffolk by Sir Thos. Russhe to the King's advantage. For Sir Thos. Nevill and the jewels of my lord of Suffolk, which he has in pawn for 700l. The men of Mynhed to be sent for to answer for the depredation done upon the Breton ship. The prisoners in the Tower; to get all the other pardons signed, and a book made of the names of those who shall be pardoned. To speak with the King for the abbess of Wilton. To remember the bp. of Worcester, and what the King will do therein. To remember my Lord Chancellor for his end. To devise instructions for those who shall be sent into Germany, and to cause them and the letters to be signed. To know whether the King will prest any more money to Cornells and other. To show both the books of the value of the lands of Christ Church to the King. To remember Conquest, for his lands lying near Ampthill; and Bremycham for his lands of Bremycham. To survey all the pardons that shall be signed. To cause warrants to be drawn for the money newly laid out by me for the King. Not to forget to search for money due to the King for his loan, and to set all the books thereof for all shires. To remember Wm. Boteres and Dr. Benett's pardons. To show the King the letters come from Hacket, and from my lord of Canterbury. A clause to be put in the instructions for the delivery of the letters. To show the King the letters from Wales. To make a bill fur the Parliament touching the augmentation of the annates. To remember the first grant of St. Bartholomew's; Woolf's Act, to pass; my lord of Cumberland. To send for the priest of Norfolk. To remember the books of the value of Christ Church; Heron, for acknowledging the fine; that Ric. Sparre and others bound themselves for 300l. for the Venetians' debts; such specialties as came from Heron to the Chancery with such money as Heron would have “dissayvyd” the King, and to cause Candyshe, Raffe and Bodye to survey them. Partly in Cromwell's hand, pp. 2. 2. Another earlier copy of the same remembrances, with the following additional items, which are all marked by a cross:—A privy seal to be sent to Dr. Glynne, chancellor of Bangor, for the revenues of that diocese for the last half-year. To devise who shall be sent to Lubeck to treat with the Lubecyans, the king of Pole and other. To remember devices for the bishops to set forth and preach the King's great cause, and also against the censures, and that the Pope be no more prayed for at Paul's Cross or elsewhere. To pay the embroiderer, saddler and silkwoman. To remember the Portingales for their free passage from Hampton to London. To know whom the King will appoint to go with Dr. Lee to Lubeck. The letters come from Hacket. How many of them have paid for the wafting of the ships. To send to my lord of London to order the preacher not to pray for the Pope at Paul's Cross on Sunday. To draw the instructions for Dr. Lee. To survey the broiderer's and saddler's bill. Touching the præmunire against the bishop of Norwich. Pp. 3. Partly in Cromwell's hand. Endd. First, to remember the ambassador of Venice. To speak with the King for sending to Hampton for the trial of the weight of certain things there. To remember the “depechee” of Sir John Wallope's man. To remember to depeche Doctor Hawkynes man. To make an end for the bishop of Norwich. A letter to be written to the King's ambassador in Spain. To call upon the cofferer for 2,000l., payable at Candlemas last. To remember the election of the bishop of Bangor to the King. To remember the engrossing of the bill of faculties. To remember the engrossing of the bill for butter and cheese. To remember my lord of Sussex for “Wrytle. To remember the friars of Greenwich to have licence to go to Ireland. To remember the lord Chamberlain's soonn (son?) for a benefice. To remember to speak with the mayor of London for provision of victual against Easter. To remember Ant. Babiugton, for assigning of his two bills. To call for the last letters from the town of Lubeke to the King, and that answer be made to them. A letter to be made to Dr. Lee, the King's ambassador. An answer to be made to Chr. Mownte's letter. 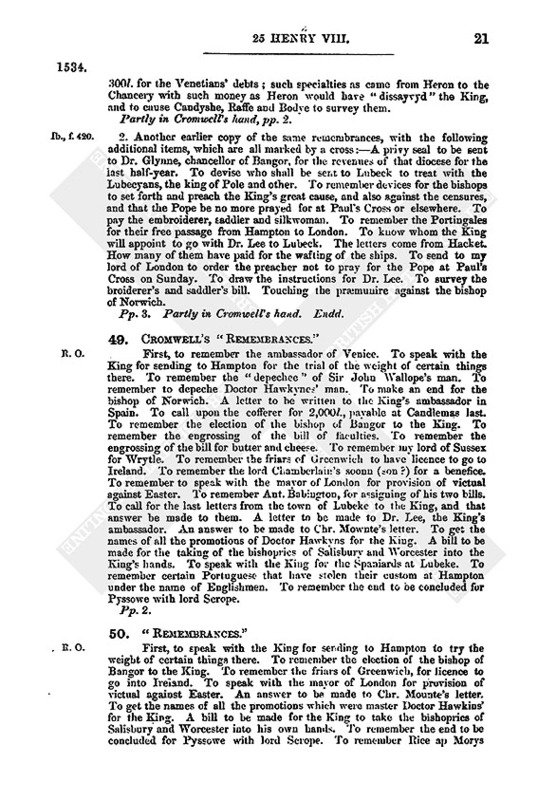 To get the names of all the promotions of Doctor Hawkyns for the King. A bill to be made for the taking of the bishoprics of Salisbury and Worcester into the King's hands. To speak with the King for the Spaniards at Lubeke. To remember certain Portuguese that have stolen their custom at Hampton under the name of Englishmen. To remember the end to be concluded for Pyssowe with lord Scrope. First, to speak with the King for sending to Hampton to try the weight of certain things there. To remember the election of the bishop of Bangor to the King. To remember the friars of Greenwich, for licence to go into Ireland. To speak with the mayor of London for provision of victual against Easter. An answer to be made to Chr. Mounter's letter. To get the names of all the promotions which were master Doctor Hawkins' for the King. A bill to be made for the King to take the bishoprics of Salisbury and Worcester into his own hands. To remember the end to be concluded for Pyssowe with lord Scrope. To remember Rice ap Morys Gough, lieutenant of Raydour, and Commotoyether. To remember the abbess of Wilton specially. To remember the signing of lord Lumley's letter. To know the King's pleasure for my lords of Kildare and Osserayde, and for the determination of the matters of Ireland. To send for the men of Mynhede, and to speak with Sir Giles Strangwayse for them. To remember the bill of complaint of the Frenchman for a piracy, supposed to have been committed in October or November last. To remember the letting of the lands at Leznes. For the end to be taken with lord Scrope. To remember how the King is ordered in the Exchequer for the farmes granted to the aluegers. “To put the bill to signing for the King's household.” To send to master Tuke for Mr. Cornpton's bill. To cause Palmer's bills to be assigned. To send to my lord of Winchester for 600 marks. To remember Hen. Whitoffe's bill to be assigned for the survey of Hampton. To remember the letters for my lord elect of Ely to be signed. To remember parson Ogle. To remember to know the King's pleasure for Rob. Fowller's answer. To cause privy seals to be made for persons in London who have not brought in their fines. To speak to the King for answer to Mr. Hakkete's letters. To know his pleasure whether he will write to Sir John Wallopp. To remember the judges for their wages. To remember my lord of Sussex for Wrytyll. (fn. 1) Eftsons to remember master Moore to the King. To remember Sir Thos. Palmer. To send into Wales for those who were supposed to be of counsel with James Griffith ap Howell, the traitor. Titus B. 1. 417. B. M.
3. “For his heir to be rebellious or disobedient they think not meet to be in the book,” as rebellion is already treason, and disobedience is no cause of forfeiture of inheritance. 4. That the king of Scots should in no wise be named, for it might give him a courage, or else cause him to take unkindness. 5. Touching the oath of them that shall swear at their liveries. P. 1, in Cromwell's hand. On a sheet of paper addressed: Sir Thos. Crumwell, one of the King privy council and master of his jewel-house. Endd. 1. To know what the King will have done with the Nun and her accomplices. 2. To go to the Charterhouse myself, 3. To remember John Conysbye. 4. To speak with the King for the part of the Princess Dowager. 5. To remember the ancient chronicles of Magna Carta. and how libera sunt came into the statute. 6. The letter for the Spaniards to be signed. 7. Whether the King will have the Dowager removed or no. 8. Money for provision for wine and Lenten stuff. 9. Mr. Bedyngfield and Mr. Chamberlayn. 10. What diets the King will give Dr. Lee, M. Hethe and Pagett. 11. To cause their passports to be signed. 12. To speak with the King for the man of Bedfordshire. 13. His fine for the 500 marks. 14. To speak with the King for More's end for the breach of the prison of Evylchester, and for the end of them of the attaynt in Surrey. 15. The forfeiture taken, informed me by one—this day. Cremwell's hand, p. 1. Endd. Warrant to lord Windsor, master of the Great Wardrobe, to deliver for the furnishing of the Parliament Chamber, five pieces of red say of the largest size, and four pieces of the middle size, three score ells of canvas,” and as much gilt nail . . . . and lyre as shall suffice for the same.” Greenwich, . . Jan. Signed at top. 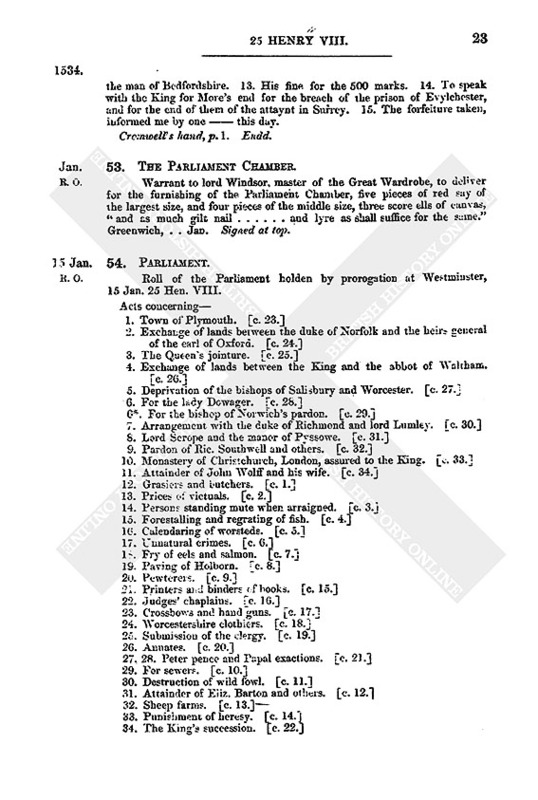 Roll of the Parliament holden by prorogation at Westminster, 15 Jan. 25 Hen. VIII. Dugdale's Sum to Parl., 497. Writs of summons to the Parliament begun by prorogation at Westminster. 5 Jan. [qu. 15 Jan.?] 25 Hen. VIII. viz., to W. (fn. 2) archbishop of Canterbury and all bishops, abbots, and priors, Henry duke of Richmond and Somerset, Thos. duke of Norfolk. Charles duke of Suffolk, Thos. marquis of Dorset, Henry marquis of Exeter, Will. carl of Arundel, Hen. earl of Northumberland, Hen. earl of Essen. Geo. carl of Shrewsbury, Ralph earl of Westmoreland, Edw. earl of Derby. Hen. earl of Worcester, Thomas earl of Rutland, Hen. earl of Cumberland Thomas earl of Wiltshire, George earl of Huntingdon, Arthur viscount Lisle, Geo. Nevill lord Abergavenny, John lord Zouche, John Tuchet lord Audley, Thomas West lord La Warr, Thomas Berkley lord Berkley, Hen. Pole lord Montagu. Geo. Bullen lord Rochford, Hen. Parker lord Morley, Thomas Fienes lord Dacre, Wm. lord Dacre of Gillesland, Walter Devereux lord Ferrers, Thomas Brooke lord Cobham, Hen. Fitz-Alan lord Maltravers, Francis lord Talbot. 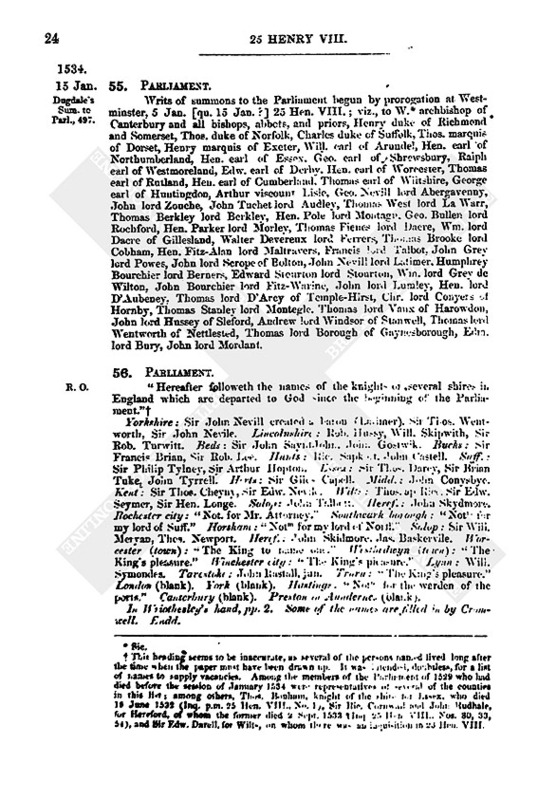 John Greylord Powes, John lord Scrope of Bolton, John Nevill lord Latimer. Humphrey Bourchier lord Berners, Edward Steurton lord Stourton, Wm. lord Grey dc Wilton, John Bourchier lord Fitz-Warine, John lord Lumley, Hen. lord D'Aubeney. Thomas lord D'Arcy of Temple-Hirst, Chr. lord Conyers of Hornby, Thomas Stanley lord Montegle. Thomas lord Vaux of Harowdon, John lord Hussey of Sleford, Andrew lord Windsor of Stanwell, Thomas lord Wentworth of Nettlested, Thomas lord Borough of Gaynesborough, Edn. lord Bury, John lord Mordant. Yorkshire: Sir John Nevill created a baron (Latimer). Sir Thos. Wentworth, Sir John Nevile. Lincolnshire: Rob. Hussy, Will. Skipwith, Sir Rob. Turwitt. Beds: Sir John Saynt John Gostwik. Bucks: Sir Francis Brian, Sir Rob. Lee. Hunts: Ric. Sapkott, John Castell. Suff. : Sir Philip Tylney, Sir Arthur Hopton. Essex: Sir. Thos. Darey, Sir Brian Tuke, John Tyrell. Herts: Sir Giles Capell. Midd. : John Conysbye. Kent: Sir Thos. Cheyny, Sir Edw. Seymer, Sir Hen. Longe. Salop: John Talbott. Heref: John Skydmore. Rochester city: “Not. for Mr. Attorney.” Southwark borough: “Notm my lord of Suff.” Horsham: “Notm for my lord of Suff. Salop: Sir Will. Meryan, Thos. Newport. Heref. : John Skidmore Jas. Baskervile. Worcester (town): “The King to name one“ Westbedwyn (town): “The King's pleasure.” Winchester City: “The King's pleasaure.” Lynn: Will. Symondes. Tavestoke: John Rastall, jun. Truru: “The King's pleasure.” London (blank). York (blank). Hastings. “Notm for the warden of the Ports.” Canterbury (blank). Preston in Aundernes (blank). In Wriothesley's hand, pp. 2. Some of the names are filled in by Cromwell. Endd. 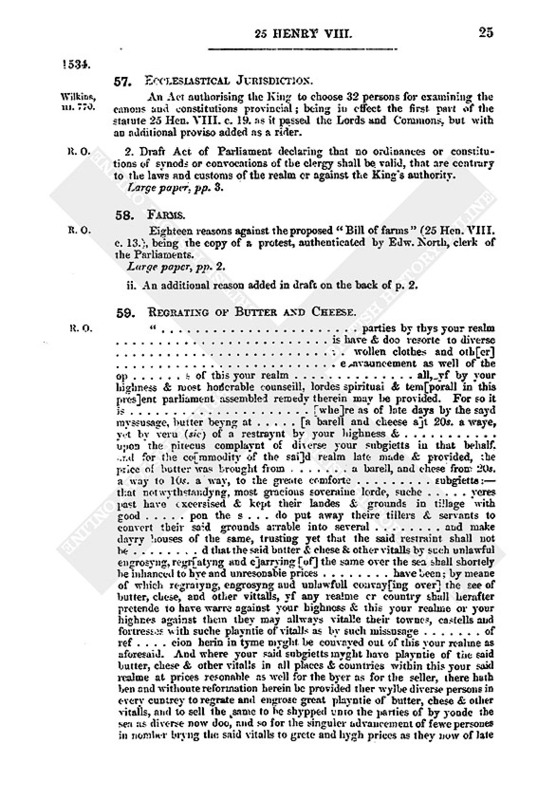 An Act authorising the King to choose 32 persons for examining the canons ami constitutions provincial; being in effect the first part of the statute 25 Hen. VIII. 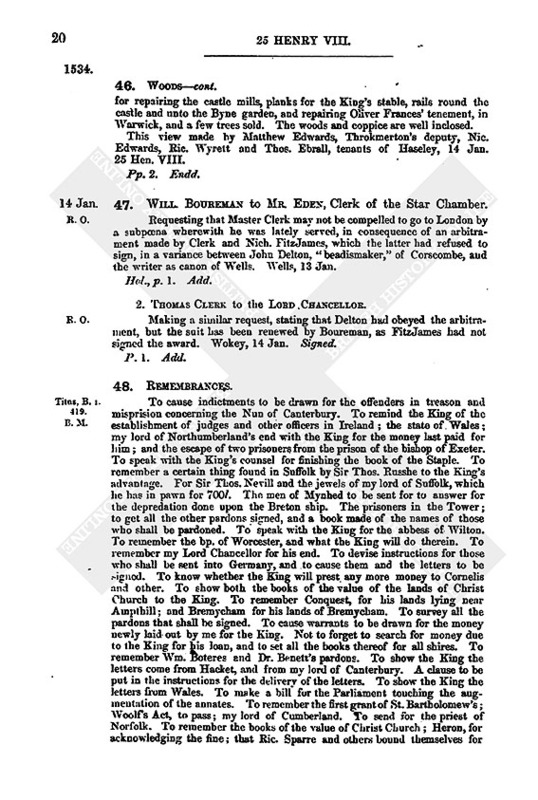 c. 19. as it passed the Lords and Commons:, but with an additional proviso added is a rider. 2. Draft Act of Parliament declaring that no ordinances or constitutions of synods or convocations of the clergy shall be valid, that are contrary to the laws and customs of the realm or against the King's authority. Eighteen reasons against the proposed “Bill of farms” (25 Hen. VIII. c. 13. ), being the copy of a protest, authenticated by Edw. North, clerk of the Parliaments. ii. An additional reason added in draft on the back of p. 2. 59. Regrating of Butter and Cheese. “. . . . . . . .parties by thys your realm . . . . is have & doo resorte to diverse . . . . . . . . wollen clothes and oth[er] . . . . . . . . e avauncement as well of the op . . . . s of this your realm . . . . all, yf by your highness & most honorable counseill lordes spiritual & tem[porall in this pres]ent parliament assembled remedy therein may be provided. For so it is . . . . . . . [whe]re as of late days by the sayd myssusage, butter beyng at . . . . . . . [a barell and cheese a]t 20s. a waye, yet by veru (sic) of a restraynt by your highness & . . . . . upon the pitecus complaynt of diverse your snbgietts in that behalf and for the co[mmodity of the sai]d realm late made & provided, the price of butter was brought from . . . . . . a barell, and chese from 20s. a way to 10s. a way, to the greate comforte . . . . . . subgietts:—that not wythstandyng, most gracious soveraine lorde, suche . . . . yeres past have excersised & kept their landes & grounds in tillage with good . . . . pon the s . . . do put away theire tillers & servants to convert their said grounds arrable into several . . . . and make dayry Houses of the same, trusting yet that the said restraint shall not be . . . . d that the said butter & chese & other vitalls by such unlawful engrosyng, regi[atyng and c]arrying [of] the same over the sea shall shortely be inhanced to bye and unresonable prices . . . . have been; by meane of which regratyng, engrosyng and unlawfull couvay[ing over] the see of butter, chese, and other vittalls, yf any realme or country shall herafter pretende to have warre against your highness & this your realme or your highnes against them they may allways vitalle their townes, castells and fortresses with suche playntie of vitalls as by such missusage . . . . of ref . . . . cion herin in tyme myght be convayed out of this your realme as aforesaid. And where your said subgietts myght have playntie of the said butter, chese & other vitalls in all places & countries within this your said realme at prices resonable as well for the byer as for the seller, there hath ben and withoute reformation herein be provided ther wylbe diverse persons in every cuntrey to regrate and engrose great playntie of butter, chese & other vitalls, and to sell the same to be shypped unto the parties of by yonde the sea as diverse now doo, and so for the singuler advancement of fewe persones in number bryng the said vitalls to grete and hygh prices as they now of late be to the great impoveryshing of your poor comens in general, and the benefit of strange realms.” In some towns in England artificers and others owing to the scarcity of provisions have put away their servants, who so being without work, “fall to idleness and new invention, some to beg and some to rob.” Ask that accordingly it may please the King, with the advice of Parliament. to enact that no one, English or stranger, may ship or convey any butter or cheese that shall be bought or that may be sold above the following prices: butter at 14s. a barrel, and under: Essex cheese, 10s. a wey and under : Suffolk and other cheese at 9s. a wey and under, under forfeiture of the whole amount so shipped, half to the King and half to him or them that shall sue for it by action of debt, bill, plaint, information or otherwise, and that no essoyne, licence or protection be allowed as defence. That it may be also enacted that, after the Feast of the Nativity of St. John Baptist next ensuing, no one shall convey any oxen, sheep or bacon beyond sea, except to Calais, Guysnes and their havens and marches, for victualling the Khig's ships, and for the merchants and subjects venturing to Iceland for fish. 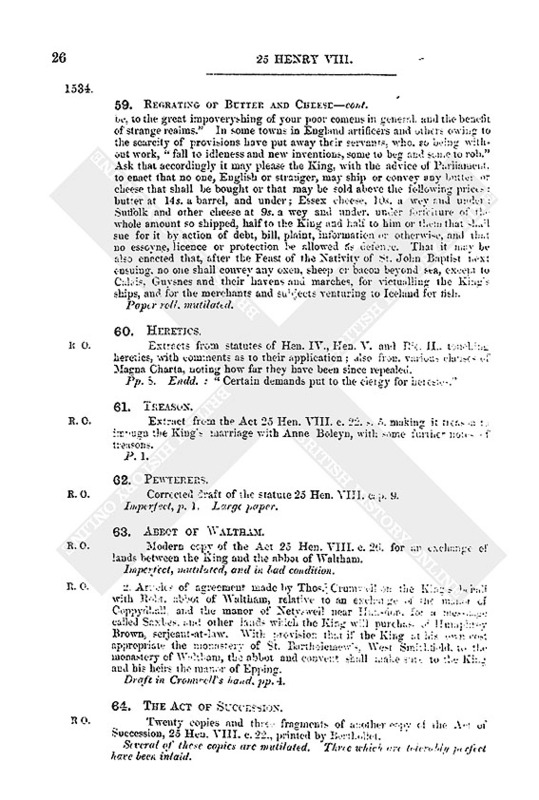 Extracts from statutes of Hen. IV., Hen. V. and Ric. II., touching heretics, with comments as to their application; also from various classes of Magna Charta, noting how far they have been since repealed. Extract from the Act 25 Hen. VIII. 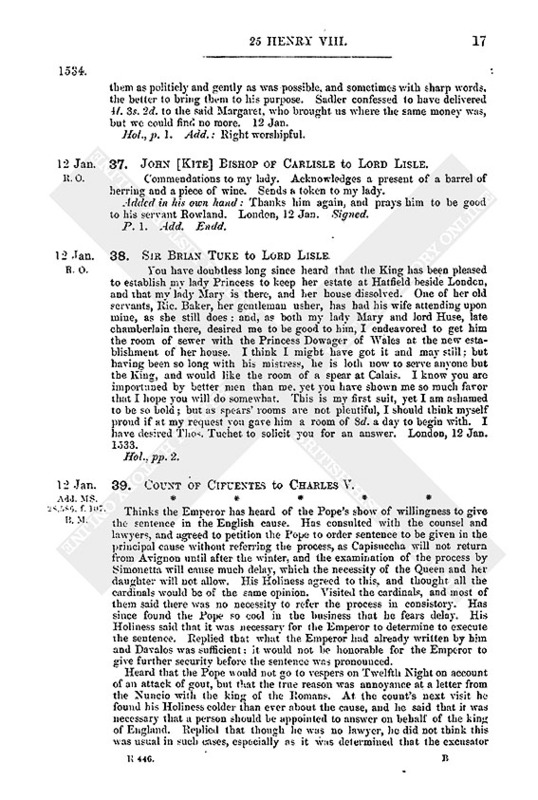 c. 22. s. 5 making it treason to impugn the King's marriage with Anne Boleyn, with some further notes of treasons. Corrected draft of the statute 25 Hen. VIII. cap. 9. Imperfect, p. 1. Large paper. Modern copy of the Act 25 Hen. VIII. c. 26. for an exchange of lands between the King and the abbot of Waltham. Imperfect, mutilated, and in bad condition. 2. Articles of agreement made by Thos. Crumwell on the King's. behalf with Robt. abbot of Waltham, relative to an exchange of the model of Coppydhall and the manor of Netyswell near Hunsdon, for a messuage called Sanbes, and other lands which the King will purchas. of Humphrey Brown, serjeant-at-law. 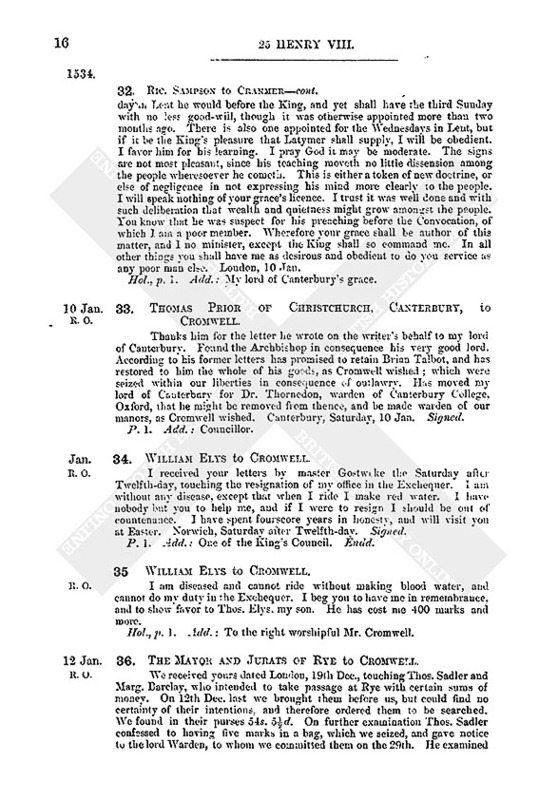 “With provision that the King at his own cost appropriate the monastery of St. Bartholemew's West Smithfield, to the monastery of Waltham, the abbot and convent shall make sure to the King and his heirs the maner of Epping. Draft in Cromwell' hand. pp. 4. Twenty copies and three fragments of another copy of the Act of Succession, 25 Hen. VIII. c. 22., printed by Berthollet. Several of these copies are mutilated. There which are tolerably perfect have been inlaid. Cleop. P. vi. 140. B.M. A treatise on the election and consecration of bishops, in opposition to Papal usurpations. Petition from Edw. Maye, the mayor, John Elam, John Courtney, Rob. Justice, burgesses. Wm. Lege and John Peke, John Stewarde. with all other inhabitants of Dover, for a harbour to be made there. Setting forth that whereas of late the town possessed 19 or 20 ships, and crayers and boats accordingly, now during the last 10 or 12 years such a quantity of small stones has been cast up by the sea that the harbour is quite closed up and destroyed. The three or four crayers which are left of necessity must ride in the open sea. There is no harbour between Tennet and Wight, but only the Downs, which is an open road. They desire the King to remember the ruin of their town and port, and also that it is a very convenient place for a haven to be made. Parchment. Add. at the head: “To the King our sovereign Lord.” Endd. Pp. 5. Corrected by Cromwell. Draft of a bill to prevent goods being sold except at fairs and markets. By the engrossing of merchandise by rich men, and by their selling corn and grain at their own houses by subtle weight and measure, market towns have become empoverished, and artisans have been compelled to live in the country, and many of them have become beggars. Artificers, except agricultural blacksmiths and farriers, to live within some town or borough under; pain of 20l. a year fine. Merchant strangers arriving in any port to Sell their geeds there by gross, under pain of forfeiting the value of the said wares. If unable to sell them there, they may ask for a certificate from the customer of comptroller, of having paid the dues, and then preceed to another port. No pedlars to sell anything except at fairs or markets. 68. Correspondence of John Wolff. 1. Everard Byscopinck to John Wulff. Respecting the loss of 366 cr. of the sun. London, 5 June 1531. Hol., p. 1. Add. : Dem Ersamon Johan “Wulffe to Dwflyng in Irlant kome dysse brerff. 2. Henry in Wyncke to Master Jan Wulloff. Has arrived safely in London. Particulars touching the theft of 366 French crowns which every man in Cologne says have been stolen. London, 3 July, 1531. 3. Ghinckel (?) to John Wolff. Another letter relating to the matter of the 366 cr. Antwerp, 24 June 1532. Hal., pp. 2. Add. : An Johan Wolffe to London in der Torre come disse breff. &c.
4. Henrick van Ghinckel to Johan Wolff. A business letter, dated Antwerp. 31 Jan. 1532. Hol., p. 1. Add. : Deme ersamen unde wys Johan Wolff to London. 5. Hanrick van Ghynckel to Johan Wolff. Another business letter, dated Antwerp, 13 Feb. 1532. Hol., pp. 2. Add. like the last. 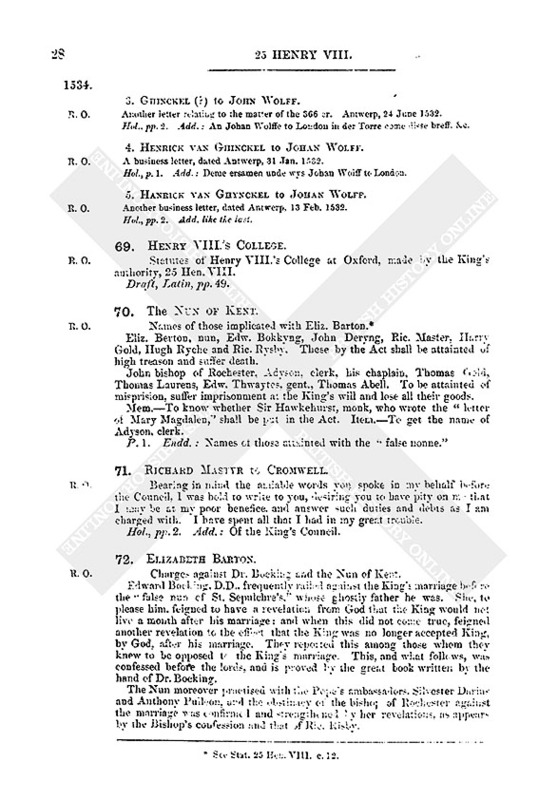 Statutes of Henry VIII's College at Oxford, made by the King's authority, 25 Hen. VIII. 70. The Nun of Kent. John bishop of Rochester, Adyson, clerk, his chaplain, Thomas Gold, Thomas Laurens. Edw. Thwaytes, gent., Thomas Abell. To be attainted of misprision. suffer imprisonment at the King's will and lose all their goods. Mem.—To know whether Sir Hawkehurst, monk, who wrote the “letter of Mary Magdalen,” shall be put in the Act. Item.—To get the name of Adyson, clerk. 71. Richard Mastyr to Cromwell. Bearing in mind the available words you spoke in my behalf before the Council. I was bold to write to you, desiring you to have pity on me that I may be at my poor benefice, and answer such duties and debts as I am charged with. I have spent all that I had in my great trouble. Hol., pp. 2. Add. : Of the King's Council. 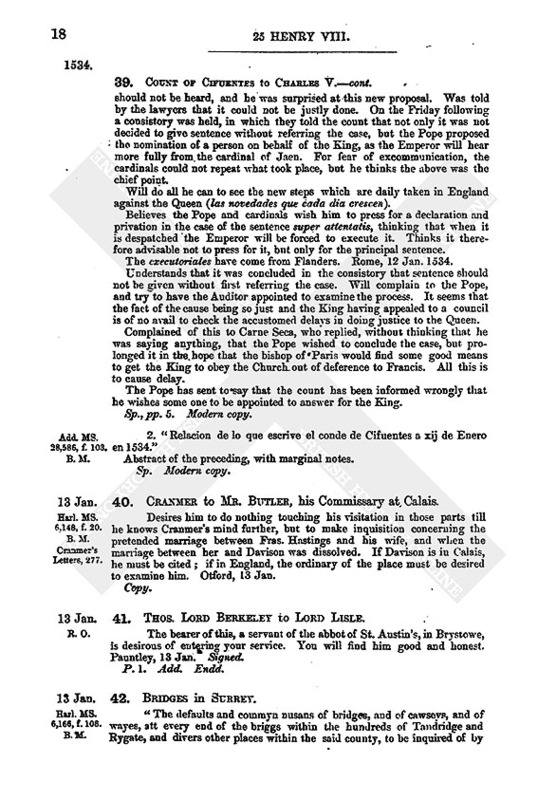 Charges against Dr. Bocking and the Nun of Kent. Edward Bocking, D.D., frequently railed against the King's marriage before the false nun of St. Sepulehre's, whose ghostly father he was. She, to please him, feigned to have a revelation from God that the King would not live a mouth after his marriage; and when this did not come true, feigned another revelation to the effect that the King was no longer accepted King, by God. after his marriage. They reported this among those whom they knew to be opposed to the King's marriage. This, and what follows, was confessed before the lords, and is proved by the great book written by the hand of Dr. Bocking. Many persons were realy to preach her revelations as soon as her spiritual father should get notice from God that it was time. These have confessed to that effect. Amongst them are Henry Gold, parson of Aldermary. London. Hugh Riche, late warden of the Observants at Richmond, Ric. Risbye, late warden of Canterbury, John Dering, monk of Canterbury College, Oxford, Ric. Maister, parson of Aldington. Kent. Gold was interpreter between the Nun and the Pope's ambassador. Ant. Pulleon. and also carried a message to the Queen Dowager, telling her that her issue should reign in England. Dering wrote a book, ready to be shown, in defence of the revelations; but his readiness to confess shows that he erred more by oversight than of malice. Rio. Maister and Becking accompanied the Nun to Our Lady at Court of Strete with more than 2.000 persons. All the aforesaid persons have done open penance at Paul's Cross; as did Laurence of Canterbury, scribe of the archdeacon of Canterbury, who copied out Booking's book in a fair hand, and Thomas Goold, brother of Henry. On a slip of paper pasted in. iii. 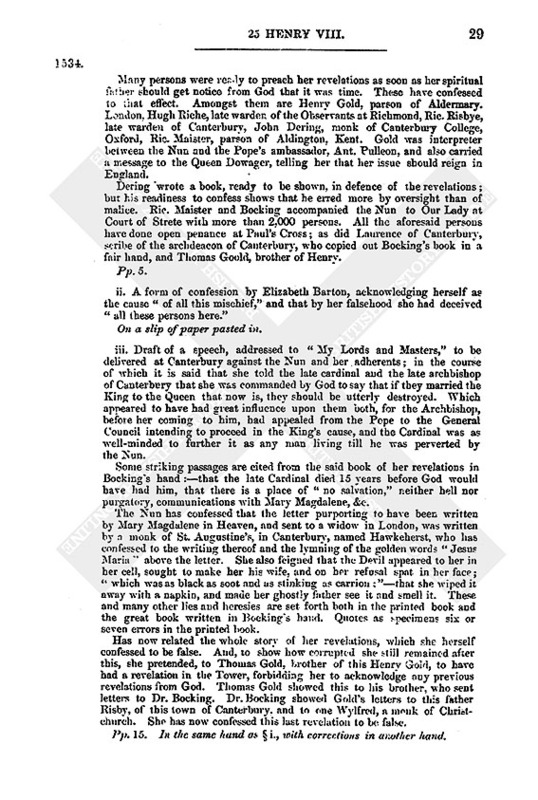 Draft of a speech, addressed to “My Lords and Masters,” to be delivered at Canterbury against the Nun and her adherents; in the course of which it is said that she told the late cardinal and the late archbishop of Canterbury that she was commanded by God to say that if they married the King to the Queen that now is, they should be utterly destroyed. Which appeared to have had great influence upon them both, for the Archbishop, before her coming to him, had appealed from the Pope to the General Council intending to proceed in the King's cause, and the Cardinal was as well-rninded to further it as any man living till he was perverted by the Nun. Some striking passages are cited from the said book of her revelations in Booking's hand :—that the late Cardinal died 15 years before God would have had him, that there is a place of “no salvation,” neither hell nor purgatory, communications with Mary Magdalene, &c.
The Nun has confessed that the letter purporting to have been written by Mary Magdalene in Heaven, and sent to a widow in London, was written by a monk of St. Augustine's, in Canterbury, named Hawkeherst, who has confessed to the writing thereof and the lymning of the golden words “Jesus Maria “above the letter. She also feigned that the Devil appeared to her in her cell, sought to make her his wife, and on her refusal spat in her face; “which was as black as soot and as stinking as carrion;”—that she wiped it away with a napkin, and made her ghostly father see it and smell it. These and many other lies and heresies are set forth both in the printed book and the great book written in Booking's hand. Quotes as specimens six or seven errors in the printed book. Has now related the whole story of her revelations, which she herself confessed to be false. And, to show how corrupted she still remained after this, she pretended, to Thomas Gold, brother of this Henry Gold, to have had a revelation in the Tower, forbidding her to acknowledge any previous revelations from God. Thomas Gold showed this to his brother, who sent letters to Dr. Bocking. Dr. Bocking showed Gold's letters to this father Risby, of this town of Canterbury, and to one Wylfred, a monk of Christ-church. She has now confessed this lust revelation to bo false. Pp. 15. In the same hand, as § i., with corrections in another hand. Sends the patent granted by the King and his predecessor to Sir Ric. Weston, under treasurer of the Exchequer. Yesterday a bill (fn. 6) passed the Commons that no person shall keep more than 2,000 sheep, and that the eighth part of every man's land, who is a farmer, shall be put in tillage. If by the King's wisdom and goodness this bill has good success among the lords above, thinks he will do the most profitable and beneficial thing that has been clone since the time of Brutus. 74. Harry Lord Morley to Lord Lisle. In behalf of Thos. Brown, the bearer, whom he knows to be a meet man for a soldier. Several honest men, his nigh kinsmen, are in the writer's service. From London, at the Parliament. Signed. See Grants in January, No. 11. 76. Duke of Richmond to Lord Lisle. Thanks for the kindness of lord and lady Lisle when he was last at Calais. Asks his favor for the three sons of one John Grenested, deceased, one of whom is in his house. The lands left to them in their father's will are wrongfully detained from them. York Place, 15 Jan. Signed. 77. 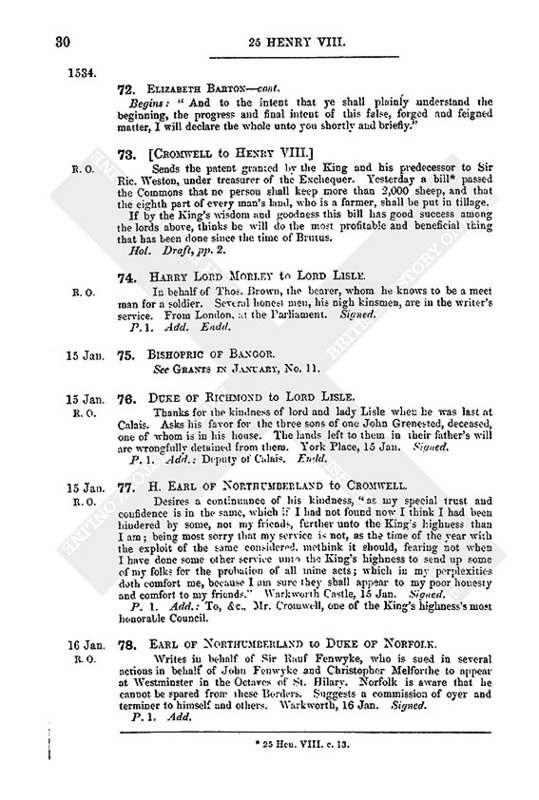 H. Earl of Northumberland to Cromwell. Desires a continuance of his kindness. “as my special trust and confidence is in the same, which if I had not found now I think I had been hindered by some, not my friends, further unto the King's highness than I am; being most sorry that my service is not, as the time of the year with the exploit of the same considered, methink it should, fearing not when I have done some other service unto the King's highness to send up some of my folks for the probation of all mine acts; which in my perplexities doth comfort me, because I am sure they shall appear to my poor honesty and comfort to my friends.” Warkworth Castle, 15 Jan. Signed. P. 1. Add. : To, &c., Mr. Cromwell, one of the King's highness's most honorable Council. 1. “For Wrytyll” is added by Cromwell. 3. This heading seems to be inaccurate, as several of the persons named lived long after the time when the paper must have been drawn up. It was intended, doubtless, for a list of names to supply vacancies. Among the members of the Parliament of 1529 who had died before the session of January 1534 were representatives of several of the counties in this list; among others, Thos. Bonham, knight of the shire for Essex, who died 13 June 1532 (Inq. p.m. 23 Hen. VIII., No. 1), Sir Ric. Cornwall and John Rudhale, for Hereford, of whom the former died 2 Sept. 1533 (Inq. 25 Hen. VIII. Nos. 30, 33, 54), and Sir Edw. Darell, for Wilts, on whom there was an inquisition in 23 Hen. VIII. 4. It is quite uncertain to what year or precise period this document belongs.. The endorsement probably refers to Ric. Gibson, who was member for Romney in the Parliament of 1529. 5. See Stat. 25 Hen. VIII. c. 12. 6. 25 Hen. VIII. c. 13.